What is the best way to take a large group around New York City or the surrounding areas? Liberty Luxury Limousine’s 56 passenger coach bus can provide with you a comfortable, safe ride with many amenities such as flat screens, restrooms and foot rests. It can seat up to 56 people and is perfect for corporate outings, large team events or for friends and family. Enjoy the scenery as a skilled chauffeur navigates the roads and provides you with a safe journey to your destination. You can enjoy the company of your companions instead of dealing with the stress of the road. The best part is, the rates are affordable. Give us a call and one of our friendly staff will work with you to fulfill your transportation needs. Our full size motor coaches can accommodate up to 56 passengers. 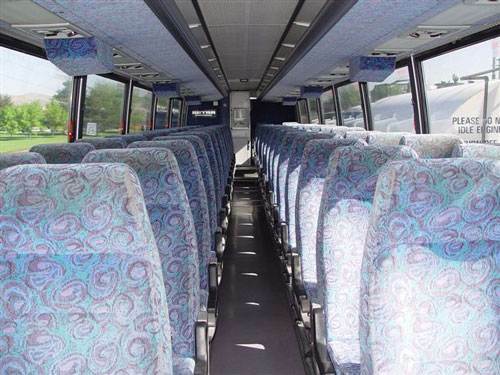 Every bus is equipped with reclining seats with plenty of leg room, individual reading lights, large restrooms, overhead racks for carry-on bags, climate controlled air conditioning and heating systems, large weather-proof luggage compartments, both DVD and VCR equipment with the flat plasma screens.